What to do with billions of useless humans? It is no news that machines have come to largely replace physical labor and computers surpass human beings in processing data. But in the future, the development of artificial intelligence may render humans obsolete even in the realm of emotional intelligence, according to Yuval Harari. Yet, AI may excel at detecting the emotional needs of human beings and reacting appropriately to them, Harari said. “What biology tells us today is that emotions are not some spiritual experience, but the outcome of biochemical processes in the body. In the future, therefore, AI could “drive humans out of the job market and make many humans completely useless, from an economic perspective” in areas where human interaction was previously considered crucial, Harari said. According to Harari, while humans are capable of displaying their own emotions, they are often less competent at reacting to the emotional needs of their fellow beings. “With human beings ... we sometimes shout back and in a vicious circle make ourselves more angry. So what should we do if AI takes over the job market? The 21st century could thus give rise to the rise of a new group of economically unproductive people, Harari said. “In the 19th century during the Industrial Revolution, the changes in technology and economy led to the appearance of a new massive class of humans, the urban working class. Harari called for a possible need to come up with “completely new models” to solve the problems of the impending era. The medical profession may also be prone to replacement, Harari noted, with AI making more accurate diagnoses based on infinite data, more cost efficiently. “Watson, unlike human doctors, can be familiar with all the diseases in the world,” he said, referring to IBM’s AI system capable of answering questions voiced by humans. Even the medical benefits of this may come at the sacrifice of personal privacy, Harari said. “Google has developed a contact lens for ... people who have diabetes. This lens measures the level of sugar (in the blood) every second. ... This will violate human privacy. Companies like Google will have access to information on your body, your most personal information. 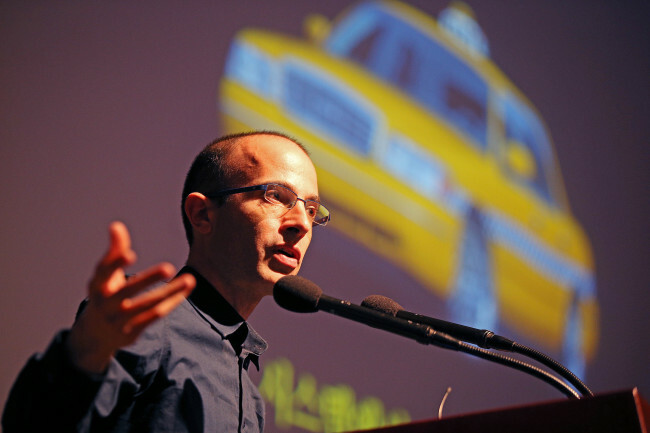 Harari, born in 1976 in Israel, earned his doctorate in medieval war history at Oxford University in 2002. He currently teaches at the Hebrew University of Jerusalem. His studies are both macroscopic and interdisciplinary, dealing with questions such as the existence of justice throughout mankind’s history and the relationship between history and biology. His first book and sweeping bestseller “Sapiens,” published locally last November, argues that Homo Sapiens came to dominate the world through mass cooperation and fabricated systems. His second book, “The History of Tomorrow,” was published in Hebrew in 2015. The English version will be published in September 2016, while the Korean version will hit stores sometime next year.